I just served up the most delicious Macaroni and Cheese. The kids were at the table, banging forks and fists.. "Dinner!! Dinner!!" I came to the table with a plate of macaroni and cheese topped with bacon and Cooper said, "What's this? This is new!" I replied back to my hungry boy with, "Just eat it!" Of course I followed that with the sweetest smile this slightly annoyed Mom can muster. 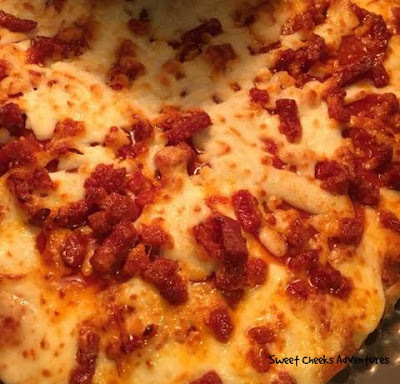 Doesn't this look delicious? This photo shows what I placed in front of Cooper this evening for his dinner. Macaroni and Cheese Topped with Bacon with a bit of a grilled cheese sandwich and fruit on the side. After the macaroni was gone, both Cooper and Ally asked for more! Save-a-Lot is proud to introduce our new mouth-watering collection of flavorful favorites made deliciously unique and crafted with high-quality ingredients. 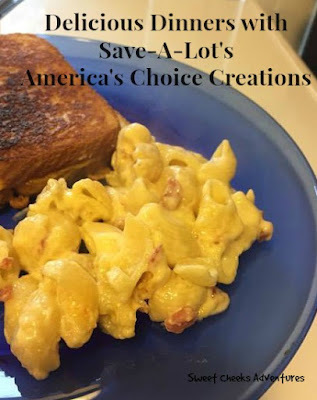 America’s Choice® Creations are designed to be EASY to make and taste GREAT. These new favorites are available exclusively at Save-A-Lot Food Stores and are the perfect way for you to indulge a little while you continue to Save A Lot. Right along with the Macaroni and Cheese Topped with Bacon, America's Choice Creations have a wide range of options. Take a look at the available products! My family tried the Triple Pepperoni Pizza earlier in the week. Everyone was a big fan. Jason commented that the pizza had a crunchy crust but the amount of toppings mixed with the crunch were a perfect combination! I loved the cheese! So much cheese and so much pepperoni were present! You can't tell me that your stomach didn't just growl. The bratwurst and the Black Angus beef patties with Cheddar and Bacon were a big hit over last weekend. We threw those on the grill and chowed down. I am ashamed to say that I didn't grab a picture of the finished product. We ate those burgers and brats right up. The beef patty was packed with flavor. We'll definitely be eating these again in the future! Last up I have got to tell you about this delicious brownie! The fudge on top is my favorite but oh my gosh, the whole thing melted in my mouth. I had to fight with both men in my house for my portion but it was so worth that fight! Interested in forming your own option? Pick up your selection at your local Save-A-Lot! To find a store near you, use the Store Locator. Enter to win a $25 Gift Card! Super Easy Giveaway here -- Just comment below with which of the available products you are dying to try. Giveaway open to US only. This giveaway will end November 4th at 11:59 pm EST. The winner will be emailed. If winner has not claimed in 24 hours, a new winner will be chosen. Oh man everything looks so great. I would be asking for more mac and cheese too!! Good luck to everyone who enters! 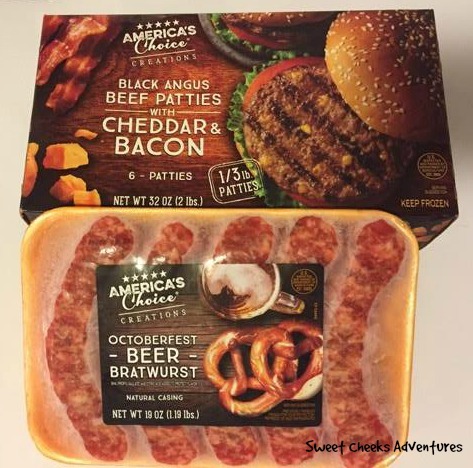 I would like to try the America's Choice beer bratwurst.